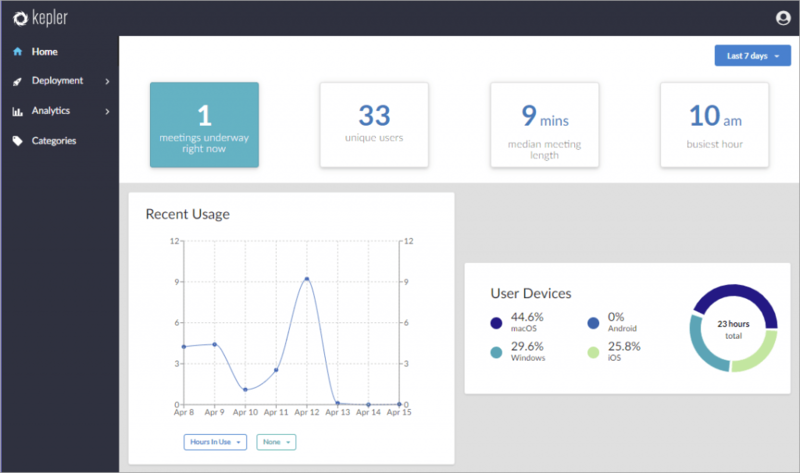 Kepler is a cloud-based application that provides metrics and intuitive analytics on your meetings and monitors the health of your Solstice deployment. Capturing the data behind how your deployment is used provides key insights that allow you to adapt your meeting spaces to respond to workplace demands and improve the efficiency and utilization of those spaces. By monitoring your deployment, Kepler can alert you to any technical issues so they can be resolved before impacting meeting productivity, which contributes to a seamless and enjoyable experience for your end-users. This is especially important for large deployments with Solstice Pods spread across multiple rooms, buildings, or regions. Kepler is available for all Enterprise Edition Solstice Pods on version 3.4 or later. To onboard your Pods into Kepler and utilize its capabilities, the Pods must have internet access and active software maintenance. You can create your Kepler account using the Solstice Dashboard version 3.4 or later. Once your Kepler account is created, you simply connect your Solstice Pods to the application using your Solstice dashboard. Kepler then begins collecting data from the Pods and monitoring them in real-time. From the list of your Solstice instances, select the Pod displays you wish to connect to Kepler. Go to the Kepler tab, then click Connect. A list of your selected displays appears. If needed, select or remove additional displays, then click Next. Read through the terms of service. If you agree to the terms listed, select the Agree checkbox, then click Next. Enter your email address, then click Next. If no Kepler account is associated with the email address entered, a prompt to create your password displays. Enter a password, confirm the password, then click Next. A notification confirming the displays have been added to your Kepler account appears. Click anywhere on the notification to proceed. Click the My Account link to be directed to the Kepler login page via a web browser. Categories provide the ability to classify Solstice instances in ways that are meaningful to you. Once created, categories can be used to filter, sort, and compare usage data among the different types of Solstice instances. Kepler allows you to choose from a list of recommended categories or create your own. In the left sidebar menu of Kepler, go to Categories. Select one of the recommended categories, then click Next. Remove any default options you do not wish to keep. Enter the Category Name, then click Next. Enter in the Options. For example, if you are creating a category to group Pods based on the floor of the building they are on, you can enter Level 1, Level 2, etc. Once you are done entering options, click Save & Apply. In the left sidebar menu of Kepler, go to Categories. The Pods that have been imported into Kepler are listed. To display certain categories in the table, click the expand icon in the Category Manager heading. Select the checkboxes of all the categories you wish to view. The selected categories appear as columns in the table. For each Pod, click the drop-down in the corresponding category column and select an option from the list that appears. Note: You can only add one option to each Pod per category. On the left-hand side of the table, select the checkboxes of each of the Pods you wish to categorize together. A blue bar appears at the top of the table. In the blue bar, click the drop-down for the corresponding category column and select an option from the list that appears. A prompt appears asking if you want to assign the category option for the selected displays. To deselect all of the Pods, click the remove icon in the blue bar. Repeat steps 3-5 to assign all of your Pods to categories. By monitoring your deployment, Kepler can alert you to any technical issues so they can be resolved before impacting meeting productivity. To help keep track of the status of large deployments, Kepler gives you a way to quickly identify which Pods have become offline so that any issues can be resolved. Email alert configurations allow you to set up email alerts that are trigged by events such as when a display is unreachable, or when a display is rebooted. These alerts allow you to passively keep tabs on your deployment to resolve issues before they impact your meetings. Kepler also allows you to view and analyze your deployment’s usage data, such as what time of day your Pods are utilized the most, to glean insights that can help you optimize your meeting spaces. In the left sidebar menu of Kepler, go to Deployment > Availability. In the Availability table, click the Status column header to sort the Pods by status. A red dot indicates the display is offline. View the Uptime/Downtime column to see how long the display has been down for. Kepler allows you to configure automated email alerts if certain events occur, such as a Pod going offline. These alerts can be set to match the needs of your deployment and allow you to quickly detect and resolve issues. You can set up email alerts to go to certain email addresses by assigning specific Pods to a category and then configuring email alerts for that category. For example, you could assign all the Pods at your Seattle headquarters to a category option for that location. Then, you could configure an email alert to be sent to your IT administrator based in that office if there are technical issues with any of those Pods. In the left sidebar menu, go to Deployment > Alerts. Under Alert Configuration, toggle the email alerts you wish to receive to enabled. The toggle switch will turn blue. Click filter next to the corresponding email alert. A list of categories you have created appear as drop-downs. Select the groups of displays you wish to be alerted for. To remove alert selected display filters, click the remove icon next to the filter option, or click remove all. In the left sidebar menu, go to Analytics > Usage. The Usage History graph displays. The data shown is determined by what displays are selected in the Displays table below the graph. You can select or deselect displays manually or filter them by their assigned categories. Only the data for the displays selected will appear in the graph. To change the graph view, you can select to view the data in Hours, Days, Weeks, or Months in the top left-hand corner of the graph. You can also select whether to view data from the last 48 hours, week, month, or quarter in the top right-hand corner of the graph. To change the data shown in the graph, click one of the drop-downs in the bottom left-hand corner of the graph and select an option from the list that appears. For example, you can select to view the number of posts. The second drop-down allows you to select another data column to compare the first column to. For example, you can select to view total users. In this example, this will give you a side-by-side comparison of how the total amount of posts relates to the total amount of users at a given time.